After giving much thought, I decided to try hosting a link party regularly. It will be every Wednesday, and next time I will make sure that you can start linking from Tuesday night. I can't say that I will do a giveaway every time, but if I have something, I might, so who knows... I think it will be fun to see what everyone is up to and to get to know more of you. Before I start the party, I will share my latest project first... I have been working on this baby blanket for the last couple of days. Christopher's teacher is going to have her first baby soon, she has been such a wonderful teacher for him; I wanted to do something nice. I love making baby blankets like this. They are quick projects, I get to play around coordinating fabrics, and I looove the feel of minky while I am working on it. For the back, I used the same minky shown in the picture. There are zig-zag stitches on the edges. A few weeks ago, I was watching a short documentary on the Japanese channel. It was about jewelry artists living in NY. They introduced a few designers, all of them had a common ground. They make "Statement Jewelries". Usually, statement Jewelries are big, bold,and most of the times inexpensive compared to its size (Think of a diamond, people pay how much for a tiny stone?). In the documentary, the reporter also said that statement jewly become popular when the economy is not doing so great. During the Great Depression era, statement jewelry was a big trend. I guess people were after the "Wow" effect and something to cheer them up for a price they still could afford. I thought about our economy now... hmm... that make sense. Those statement jewelries are everywhere. I usually perfer small real jewelry. BUT, I see so many pretty necklaces, earrings, and rings to drool over. They sure make a plain outfit shine. I particularly liked one desinger who collects antique parts and pieces to make her original jewelry. She showed some of her collection. My eyes went wide, while hold a dust rag in my hand (I was dusting the furniture). Wow, they were truly a piece of history. I have been itching to find my own statement jewelry pieces. I am no expert with antiques. Nor, can I tell the difference when I find something; what is "old" and what is "vintage". They sure sound sooo different. Although, when I see something I can immideately tell if I love it or not. If I think it's beautiful, that's good enough for me. The other day, I found two jewelry pieces that I fell in love with at a local thrift store. They are unique and my style. Above all, they were $2.99 each! Then, this gorgeous pendant head with dainty detailes. Lucky me! I found a chain that would match with the pendant in my jewelry making box! I can start wearing it right away:) Next time when you go visit a thrift store, or yard sale, look around a bit carefully, you might find a piece of history too. First of all, I want to give a big "THANK YOU" to all of you who linked or left comments on my Link party!! I was a little bit nervous about doing that, fearing what if no one wanted to do this... well, because of you sweet ladies, I think it was a success! I was really busy the last few days, so I could not leave comments on everyone of your blogs, but I visited all of them, and was really amazed with your creativity! Isn't it fun to see what everybody is up to? I will give it a little more thought and decide if I will host link parties regularly. I am hosting a baby shower for a really good friend of mine in April. I borrowed a window treatment from the babies room so I would know the theme color. I hope everyone had a good start to their week. I will see you at the next post! I am so happy to see that many of you participated in my first link party! Thank you so much for your readership and your support for of my new adventure. I am thinking about hosting either a weekly or a monthly link party. What do you think? I couldn't leave a comment on each one of your posts, but I visited everyone of your lovely blogs. I am marveled by all of the projects! The link party will be open until Sunday night at midnight. 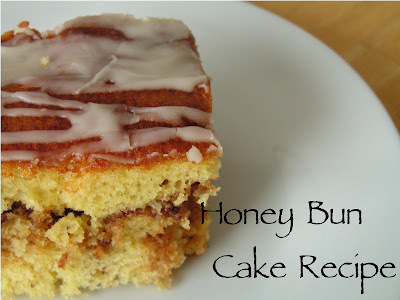 Two post ago, I posted our Sunday dinner, and I recieved many comments and emails for the "Honey Bun Cake" recipe. I found this recipe in the local paper and it is originally from www.bettycrocker.com. Yes, this is a cake that uses a cake mix! Super easy and good. I love baking from scratch, but when I don't have time, a recipe like this is definately a life saver. 1. Heat oven to 350. Lightly flour and grease 13 x 9 inch pan, or spray with baking spray with flour. 2. Beat cake mix. oil, eggs and sour cream on low speed 30 seconds, then on medium speed 2 minutes, scraping bowl occasionally. Spread HALF of the batter in pan. 3. In samll bowl, stir together brown sugar, pecans and cinnamon: sprinkle over batter in pan. Carefully spread remaining batter evenly over pecan mixture. 4. Bake 44 to 48 minutes or until deep golden brown. In another bowl, stir powdered sugar, milk and vanilla until thin enough to spread. Prick surface of warm cake several times with fork. Spread powderd sugar mixture over cake. Cool completely, about 1 hour. Store covered at room temperature. I actually had this cake warm with vanilla ice cream on top. It was sooo good! (This explains why I haven't lost the last 10 lbs. of my pregnancy fat yet. I love food too much!) My whole family loved it. It was all gone by the next day. Enjoy! Hi everyone! Like I said in the last post... I will host my first link party here at Tea Rose Home!! I thought the link party would be more fun and exciting, if I do a giveaway at the same time. You wanna know what the prize is? Last week I did a tutorial for Blue Cricket Design where I showed you how to make a bracelet. I am giving away the same style of bracelet, but I'm going have the winner specify the size and the color! You don't have anything to show off this time? Don't worry! If you leave a comment and participate, you will be entered to the giveaway too. I know it will be extremely difficult for me to pick just one person as a winner based on the project, so the winner will be chosen randomly. 3. Please grab the "Tea Rose Home" grab button, and link back from your post. If you can mention about the party on your post or place the button on your side bar, that would be great! I want more people to have a chance to come and show off thier creation and enter the giveaway. 4. One more thing, please DO NOT link anything inappropriate or any kind of advertisement. Don't be a party pooper! Go visit people on the list and say hi, see what people are up to. Have fun! Well, I am little anxious, but hope to see many of you there!! Our family is casual. We certainly do not have a traditional Sunday dinner evey week. If I felt like it I would make a big dinner, but if I have something after church or am too tired to cook... our Sunday dinner would be "leftover special". then, Honey Bun Cake. My family loooved this cake! After I packed what was left for lunch this mornig, the only thing left in the cake pan were crumbs. When I warmed the cake and put some vanilla ice cream on top(somebody stop meeee! It is more calories!)...ohhh... it was exceptionally good. I wanted to share the recipe, but I am too lazy to go downstairs and look for the recipe, so maybe some other time. What if I started hosting a linking party? That way you laidies out there who are creative and want to share your creations can have a place here at Tea Rose Home! I always get nervous when I try something new, but if some of you are interested, I certainly want to give it a try. Let me know what you think. If I can figure out how to install Mclinky on my blog, I might do it some time in the next few posts. What do you think? Would you like to come to a party at Tea Rose Home? Hi there! As I mentioned before, I am doing the blog swap today. It was so hard for me to not to spoil the surprise. I am very thrilled to have Becca from Blue Cricket Design here today! Her blog is one of the cutest blogs out there. If you haven't met her yet, here is your chance to get to know her. I will be over at Blue Cricket Design to share my tutorial today. Come check it out if you are wondering what I am up to. Ok Becca, take it away!! Hi Tea Rose Home Fans! I'm Becca From Blue Cricket Design and I could not be more excited to be here on Sachikos' beautiful blog! I have to say that I simply adore Sachiko! I think her talent is easily seen here and I am so honored to be here on her happy blog! I'm a mother and wife and lover of Mint Oreos! I am a self taught sewer and could spend hours at Home Depot in the paint department if I had hours to spare! I am addicted to fabric and can't go anywhere without looking at the world around me in "Tutorial Mode!" Everything has become a step by step possibility and I have to say I LOVE IT! I've created a simple and easy St. Patrick's Day project for you to enjoy! I have to admit I'm not the biggest fan of this holiday! I think it has to do with the fact that it has limited projects. I'm not exactly into commercial decorations for any holiday so this one becomes even more limited if I'm not in the mood for Leprechauns and pots of gold on my walls! Here's an easy way to get into the spirit of the holiday without going too commercial! Spice up your kitchen with a simple Green Tea Towel and consider yourself good! I bought these towels at the dollar store! Never under estimate the power of your local Dollar Store! Don't limit yourselves to the holiday selection. These green towels were in the housewares section! And all we'll do is add some green Ric Rack and Ruffles! It really it that easy! And straight stitch them on! It's the tiny little details that add just the right amount of personal touch! For less then $2 You too can create a St. Patty's day Accent! I'd love for you to come and see what else keeps me busy! Blue Cricket Design is my collection of all thing creative! I have a weekly linking party every Wednesday that allows you to show off your own amazing creations! Come join in on the fun! Thanks again Sachiko! You are as charming as they come! Mmmm...what a cute towel! This tutorial is transformable to any holidays, you just need to change the color theme. Wouldn't you agree? Thank you so much for the great tutorial Becca! Oh, Becca one last thing, I have never tried mint oreos before, you got me interested!